Alamo City Truck Service was originally known as Sigmor Truck Service, created by Tom Turner, Sr. to service the Mission Petroleum Carriers’ fleet of trucks and tanker trailers. Located at what used to be the back lot of the Sigmor home office on E. Houston Street and E. Commerce Street, Alamo City Truck has prospered over the years. 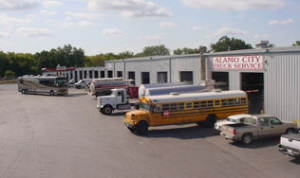 Today, Alamo City Truck Service has 25 bays at the facility where they offer service, maintenance, repair and inspections on all makes and models of any truck, trailer or coach made. Over 35 technicians provide decades of experience to fix heavy and medium duty trucks, trailers, school buses and entertainer and tour coaches. Customers from San Antonio and the entire Texas region rely on Alamo City Truck Service for their wide-range of expertise and skills. With the growth of the Eagle Ford Shale region just southeast of San Antonio, Alamo City Truck Service has grown to be the shop to service the energy industry, delivering quality maintenance and repairs to industry trucks and tanker trailers.